In this cold weather, you can resist some nice hot comfort food? Some may suggest a cup of hot chocolate but we would like to suggest something different, a route along the restaurants and bars that serve the best calamari sandwiches in Madrid. Tasty, crunchy and traditional to the core. Want one? On Calle Botoneras, 6, and next to Plaza Mayor in Madrid is this temple of Madrid’s most famous sandwich, decorated with blue and white tiles and with a bar that works non-stop serving what many consider to be the best sandwich in the city. Best of all, sandwiches are sold at an excellent price considering the generous serving and are made using the best ingredients. Don’t walk away if you see a long queue at the door because sandwiches are served quickly and in less than 10 minutes you will have yours, ready made and nice and warm. Another traditional spot to taste this delicious sandwich is El Brillante, located opposite Atocha train station, more specifically on Plaza Emperador Carlos, 8. You can’t say you’re a calamari sandwich expert without having visited this place. Here, they serve large sandwiches at a good price to go with a nice beer, served on a traditional metal bar. If you still want more food don’t worry because they serve a delicious Spanish omelette that will make your mouth water. On Calle Fernández de la Hoz, 53, is this unique restaurant which has a unique view of the calamari sandwich. To start, they toast the bread and fill it with cuttlefish rings to make it juicier, although these are not deep fried in normal wheat batter but rather chickpea batter. Yes, you read that correctly. All sandwiches are then accompanied by green Italian peppers and a chilli and garlic sauce. An explosion of flavour in your mouth. The total revolution of calamari sandwiches is in this temple of fine dining located on Calle Mirallos, 36. Here you can find calamari set on thin crusty bread with a tomato vinaigrette and lemon mayonnaise. Delicious. 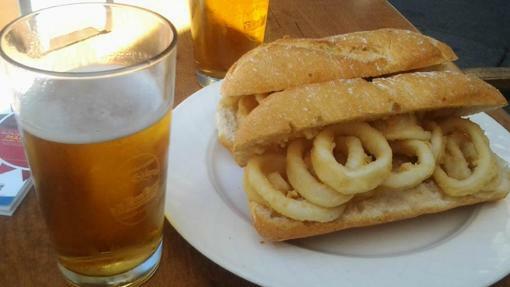 What are you waiting for to try Madrid’s best calamari sandwiches? Are you into drama and history? Discover the theatrical visits to the castle Manzanares el Real.